Need a singer to perform at a venue, a party, or an event, Ivan Skinner is a legacy has a firm reputation of providing the right ambiance for most any audience. 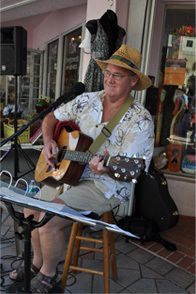 Ivan has performed at numerous venues in the Palm Beach County area. Here is a partial list. Ivan Skinner is a member of the National Association of Wedding Professionals. Whenever asked about the kind of music he plays, Ivan gives an unusual reply saying “adult music.” This is not to imply anything lurid or obscene, but rather it is elegant music for those who have evolved their sense of self and song. Avoiding watered down pop, boring blues, one note songs, formula country, and loud numbing repetitiveness, Ivan’s selections are always great melodies and lyrics, with a steady rhythm and good vocals to keep your toes tapping, stimulate your conversation, and inspire you to dance. With over 170 songs, Ivan covers the musical spectrum with ballads, country, dance, jazz, love songs, classy blues, originals, rock-n-roll, standards, tiki-tunes, waltzes, and western swing. Using a high quality sound system, Ivan does not need a band-in-a-box or other artificial sound tracks. His skill and talent are more than sufficient to carry the event, and he is always mindful to adjust the volume so that patrons do not have to raise their voices to enjoy their conversation. To contact Ivan for booking, please email iskinner1@earthlink.net or go to the contact page.